"My passive-aggressive art gallery is thriving." There are few things as annoying as being roomies with a Sloppy Joe. Once-white socks strewn across the living room floor, waking up to last night's dirty dishes when it was their turn to clean, or having to navigate your way around piles of their belongings – these are just some of the nightmares experienced when sharing a living space with a slob. Addressing the issue often helps... but this guy decided to take a different approach. A comedian called Justin Cousson strategically placed passive-aggressive notes around the house for his untidy housemates to find. 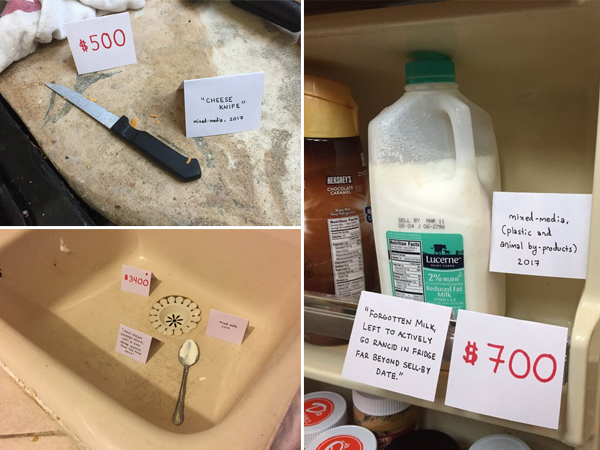 Justin, from Los Angeles, placed sour milk, dirty cutlery and shoes, among others, on "auction". The goofball put descriptive notes, along with the price of each item, next to the valuable pieces of filth, making his messy house an art gallery. The joker took to Twitter to advertise his pieces to potential buyers. Read more: Pretoria woman’s hilarious response to ‘Your boyfriend made me pregnant’ text goes viral "My passive-aggressive art gallery is thriving, although some critics don’t care for my emphasis on found pieces," he wrote. His tweet garnered nearly 4 000 retweets and more than 7000 ‘likes’. But whether Justin’s humorous take on a usually upsetting issue brought any changes to his living conditions remains unknown. But if his final tweet on the 'exhibition' is anything to go by, we're assuming his problem is far from being solved. "I must inform you that reports the exhibition is complete are, in fact, inaccurate."